Science as a destiny: It's an infection! My PhD project - investigating the differences between compatible and susceptible interactions between host plants and parasitic weeds- depends in my model system working. If I cannot get Striga gesnerioides, a vicious parasite which devastates cowpea harvests especially across Africa, to infect Arabidopsis thaliana, the 'fruit fly of the plant world' then my plans would be scuppered and it would mean a compete project redesign. So I was very nervous when it came to opening up my first pilot rhizotrons systems, infected way back in December last year. Peeling off the foil covers, I wondered what I would find. A scattering of dead parasite seed? Or flourishing tubercules, connected to he host root system? I need not have worried, the infection was a success! 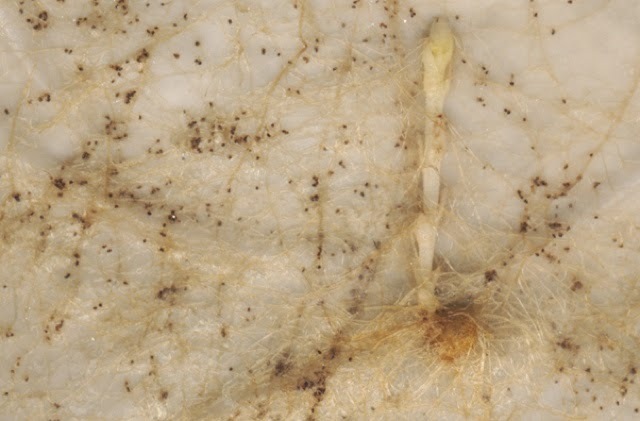 Large, dark knobbly tubercules were clearly visible on the Arabidopsis roots, at the sites where the parasite seed had germinated, sprouted radicles and forced their way into the root system. 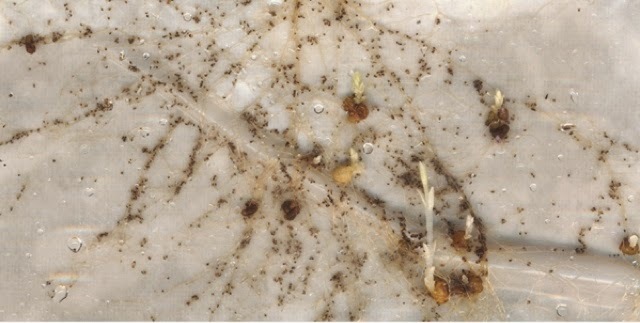 The parasites are now living off the water and sugars which the poor Arabidopsis hosts supply through their vascular system. Some of the tubercules had even advanced to the stage of sending up flowering shoots, a clear sign of a happy parasite! So it's chicks away and full throttle forward with my research agenda!